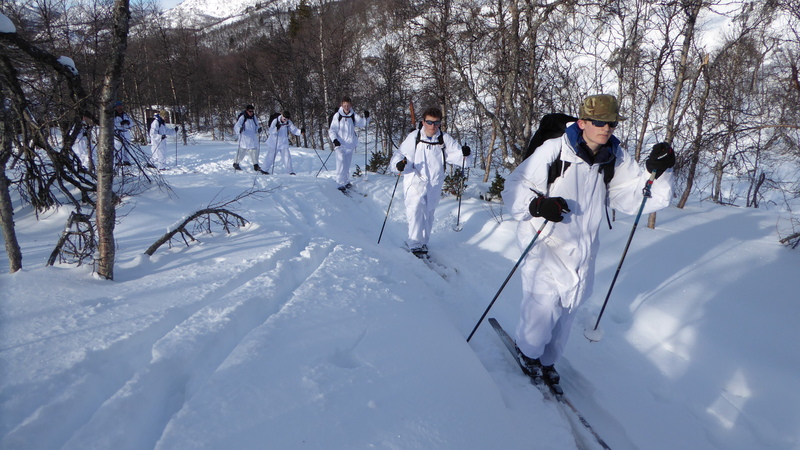 Loretto CCF undertook a cross country ski expedition to Norway in February 2016 following in the footsteps of Norwegian saboteurs who had a mission in WW2 to destroy a heavy water plant in Rjukan, S Norway to prevent Hitler from building the atom bomb. The aim of the expedition was for the cadets to complete an arduous battlefield tour journey following the saboteurs’ route through the mountains to Vermork and to learn of the saboteurs’ survival in the mountains and their raid on the factory. 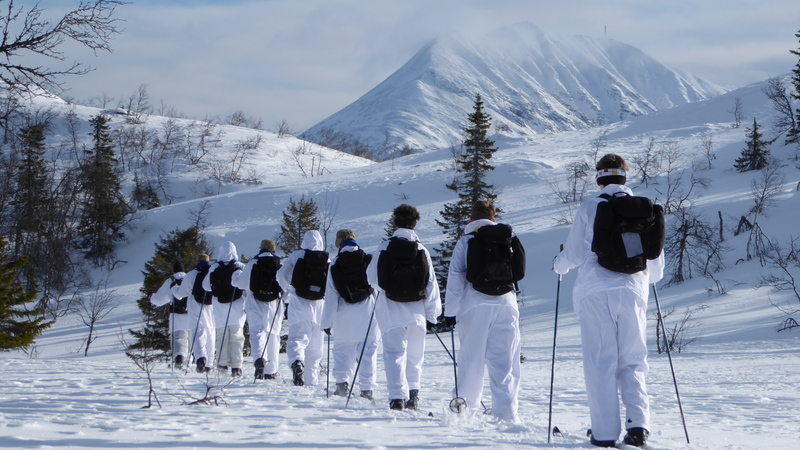 Our cadets would learn how to cross country ski, develop physical robustness, their self-reliance and self confidence in a winter environment. This would be the first time UK cadets would undertake this arduous battlefield tour. 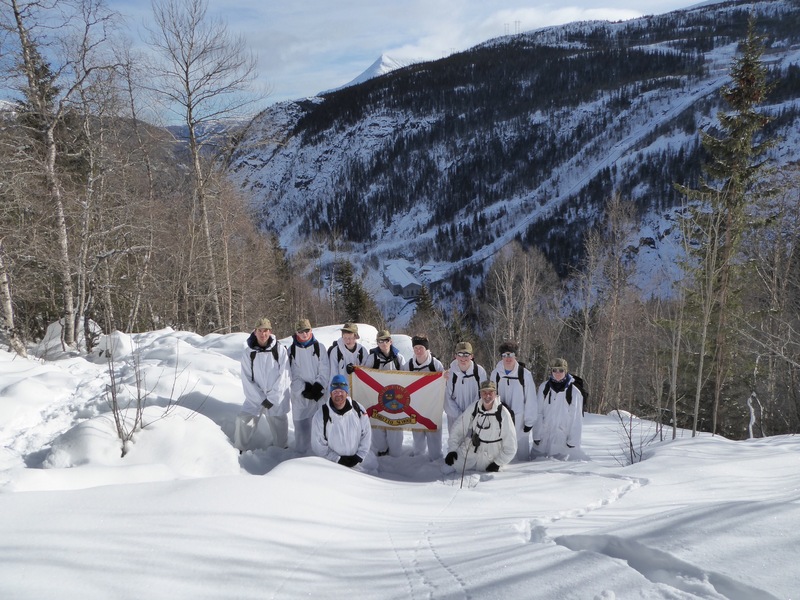 Eight cadets showed willing and during a busy autumn term the historical events of the Heroes of Telemark story were told and researched by cadets. They watched a film and a University Air Squadron video of their Telemark expedition. David Howie led the expedition with Ged Woolley, our Contingent Commander in support. The team experienced a stormy day on the Pentland hills in November for a 15km walk – this was to test their ability to look after themselves in the outdoors. All cadets were blown off their feet slipping on wet snow and grass throughout the climb and had to take refuge using the group shelters they carried. They all found it challenging to make progress along the route. Returning battered from the experience the group practiced the use of the group shelter as they got very wet attempting to use it on the hill – a valuable lesson learnt! The departure day arrived and the team had packed their equipment and clothing and travelled by air from Edinburgh to Kristiansand in South Norway via Amsterdam. The team travelled to Evje in the Setesdal valley and met Brian Desmond, the battlefield tour guide and Glyn Sheppard the mountain guide who issued them with skis and equipment and after a lecture on mountain hazards, set the scene for the training phase. The cadets stepped outside to minus 15 for their first day of ski training where they were introduced to basic techniques on skis. Then with Glyn Sheppard and David Howie (the expedition leader) they skied a short route learning to use their core muscles to coordinate their skiing technique and develop an active balanced posture. There were many falls yet they all progressed and the cadets soon got used to getting up and working hard. The next three days consisted of longer ski journeys so that they could build up their confidence on skis and improve their technique across undulating terrain. The cadets learnt how and when to adjust clothing to weather conditions and how to apply herringbone technique to uphill climbing. 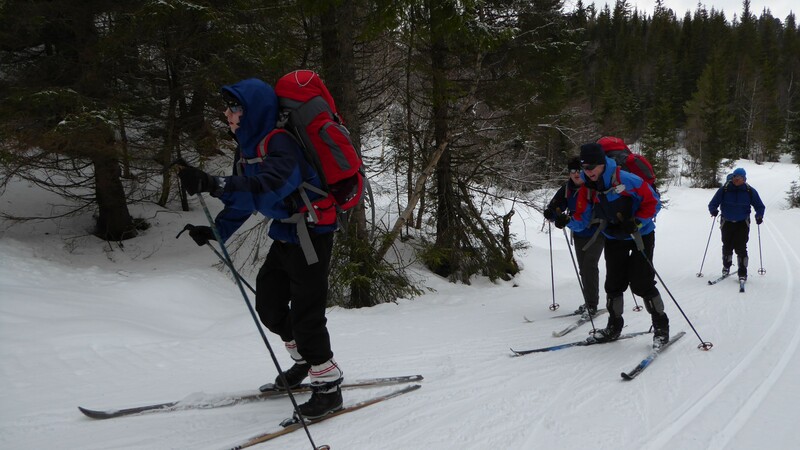 On day 3 Glyn and I took the cadets on a longer ski tour with more climbing and downhill runs. It was another cold day, minus 10. Each cadet carried their expedition rucksack with lunch and warm clothing and a log each for the lunch time campfire. This got them used to the expedition rucksack whilst skiing. At lunch time the cadets had a go at digging emergency snow shelters – all challenging stuff yet a necessary exercise for them should they need to find shelter in the mountains. They built 4 good shelters, a good first attempt and they thoroughly enjoyed it. The ski back was mainly downhill and all cadets were determined to get down the hill without falling over; maybe all except one – a great effort. The final ski training day was at Hogas, a local wooded area above Evje. It was minus 4 and the cadets carried their full weight expedition rucksacks. They all worked extremely hard at keeping their balance with the heavier packs. It was also an opportunity to wear and test the Bergans mountain jacket and salopettes bought from a Navy cadet grant. The cadets all commented on how robust the jackets were with the ¾ length keeping them warm and protected around the waist. 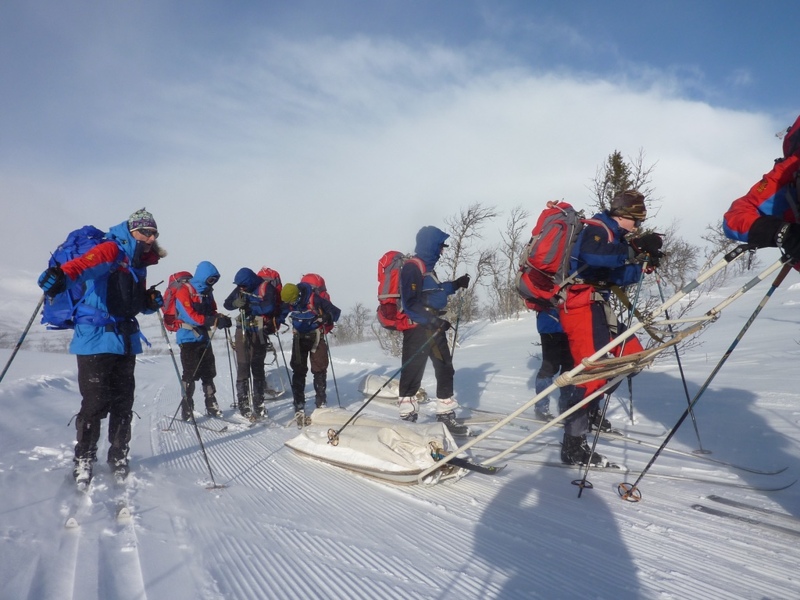 Day 5 and the cadets packed their rucksacks and skis onto the sleds behind the skidoos and got dressed in their Bergans shell clothing, hoods up and goggles on. It was a cold journey as they sped through birch woods then much colder down across the lake ice. After reaching the hut at Bernuten, Glyn got the stove fire on and gave everyone a brief on how to live in a mountain hut and what jobs were to be done; collecting snow to melt for water, keep the fire stoked and supplied with logs and to cook. Glyn explained that Bernuten hut was the local HQ for the Norwegian Resistance due to its remote location and that the boys would be sleeping in the very beds the saboteurs would have slept in. Then it was outside on to the lake and Glyn showed everyone how to ski and pull the pulks. Cadets in teams of three, practiced change overs and hill climbing using 2 pulling and a pusher. Loretto cadets were now ready for their journey through the mountains. The next day dawned cold at minus 8 with no wind yet a mist covered the lake as the team set off. Glyn led and David brought up the rear as the cadets skied and pulled pulks in between. Pulk change overs were every 20 minutes and Glyn kept the cadets to this timing and all fell into this routine quickly. The mist was down, no views, no features so it was heads down and keep pulling pulks. 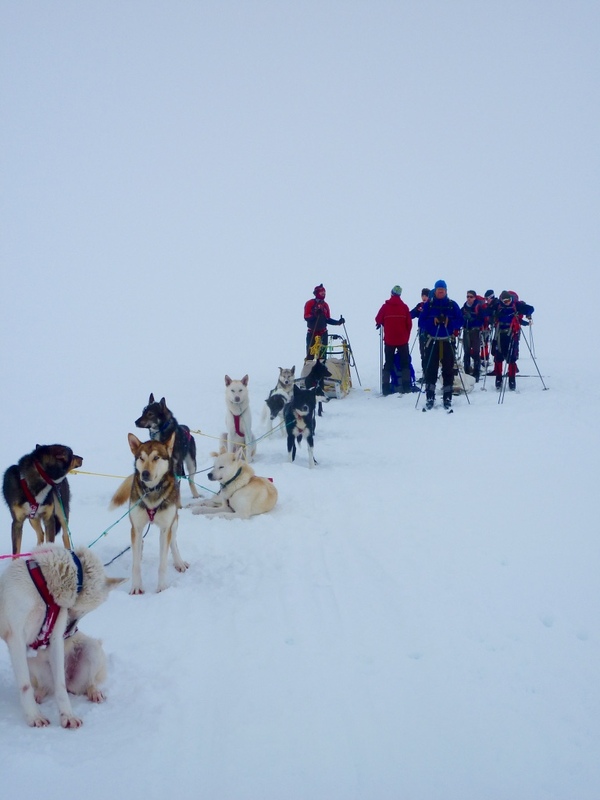 Then, out of the mist came a dog sled team – an impressive train of 12 dogs with Olav Shettel driving them. 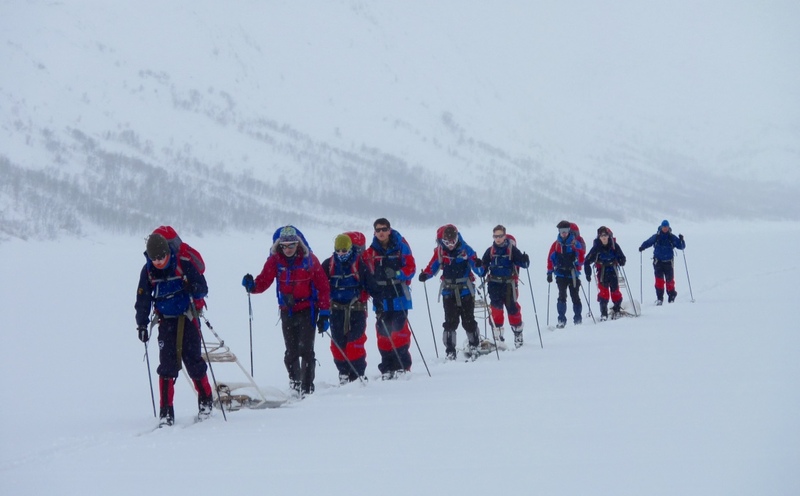 The dog sled gave the cadets the opportunity to offload their food bags, the heaviest items in their rucksacks, before the big climb up the valley – what good timing. Olav’s team was also part of the expedition emergency plan should we need to evacuate someone. The climb was 4kms of steadily pulling and skiing through deep snow. At the pulk changeovers everyone drank and had a snack before onward progress, up to the col where the clouds broke to give stunning views down the other side. A lunch stop was welcome after the long climb and everyone could see their track snaking away down to the lake they’d come from; they all realised what a big climb it was. The descent was difficult but the group reached the next lake by 3:30pm after a few impressive falls. Olav had driven the dog sled team back and had reached the huts a good 2 hrs ahead of us and had dug the hut entrances out and even lit the stoves for us to arrive to a warm hut. Snow collecting, the stove fired up and sorting kit was the routine and everyone mucked in. There were two huts on Bitdal Lake and David took the first hut with Tom, Cal and Charlie and had a warm night whilst Glyn and Ged and the other five skied to a larger hut another kilometre on. They were woken by a cold blast – someone left the door open after a call of nature – not a good start to the day for the leaders, one of them with wet boots! The groups met on the lake the next morning and skied along Bitdal Lake towards the next hut. It had snowed during the night and skiing through deeper snow made everyone tired as they progressed along the lake, which was protected by impressively steep mountains either side. After a short steep climb off the lake the group had to negotiate some steep descents through birch woods to the hut. Falling in deep snow meant an exhausting recovery and it took a few of the cadets a while to dig themselves and each other out. Tired, the team regrouped and skied through the woods arriving at Reinar Hut at 2:45pm. This hut was comfortable as it was a holiday hut which belonged to the family of one of the saboteurs and there was memorabilia all around. Once the group settled into the hut and made drinks, a few of the boys ventured outside and started digging a snow hole shelter in the snowdrift next to the hut. The other boys headed down the dog sled tracks to find Olav Shettel and the dog team camped in the woods, Olav Shettel in a lavuu, a Norwegian tepee, this one with a stove roaring away and reindeer skins spread all around. Olav gave the boys a short history of Norwegian life and afterwards the boys visited the dogs, some more friendly than others. Their husky pedigree was obvious and when not disturbed they made a circle in the snow and laid down in a ball sheltered from the wind. The boys skied back, two snow-shoed as the light faded and the temperature dropped suddenly. The last day dawned windy and it felt colder with the wind-chill. As the group skied east through deep snow and sparse birch wood there was little shelter from the wind. Arms were wind milling and hoods went up. I called a stop and everyone put on an extra layer and outer gloves and with goggles on, the group moved steadily on reaching a ski track amongst a small hutted community. There were two hills to climb in the last 3 km and the boys made a big effort knowing there was a hamburger lunch at the end (Brian had told them!). The pull up the last hill was a triumph for the group and there they met Olav Shettel with his dog team. After dinner at the hostel, Brian met the team and congratulated them on their achievement of completing the battlefield journey. However, he said, ‘tomorrow morning you are going to re-enact the raid on the heavy water plant at Vermork just as the Norwegian soldiers did in 1943’. The next morning the team were given white camouflage over trousers and jackets and with their black day rucksacks and forage caps the cadet group looked the part. The morning was cold and clear – the best day yet. They skied through woods as the sun rose, passing two depressions in the ground – these were bomb craters from the US bombing raid. They reached the bottom of a steep hill where Glyn instructed them to put their skins on the bottom of their skis to make the climb easier. After a drink and food and a few photos taken, they skied on before moving into the shade and deeper snow. They passed a saboteurs hut, the last one they used before the final assault. The woods became denser so skis were taken off and the group moved down through a steep gully and got their first view of the Vermork factory, as the saboteurs would have seen. 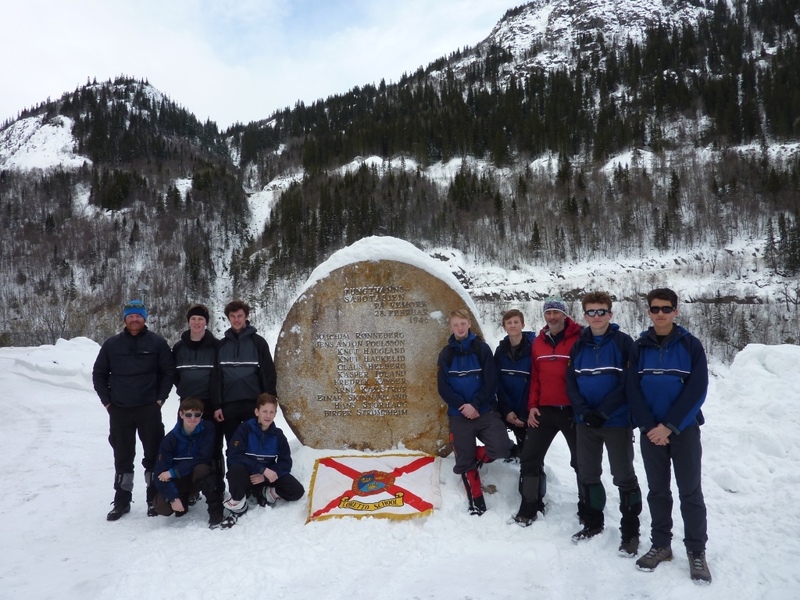 It was the culmination of a nine day journey on skis following the same route the saboteurs took in the winter of 1943 and the first time any cadets had undertaken such an arduous battlefield expedition journey. The cadets then toured the factory, now a museum, where they watched a film of the saboteurs’ story. The final act was to take the escape route from the valley floor to the top of the cable car on the rim of the steep sided valley. The track had 21 bends and climbed 900 metres and one cadet, Charlie, ran up in 35 minutes – a great achievement. Everyone gathered at the top, tired from the effort and one by one they realised they had completed a hard 4-day journey through the mountains in cold and difficult snow conditions pulling their equipment and escaped! From here 73 years ago, the 6 saboteurs split into two groups, one group heading west into the Hardangervidda where our group had come from, whilst the second group skied north then east to escape across the border into Sweden. But that’s another story …. Loretto cadets would like to thank the Ulysses Trust for the grant that made it possible to use the support of a dog sled team which contributed to the overall success of the expedition.